News was recently published that reviewed all the cars owned and driven by Christiano Ronaldo, the sensational football player of all time from Real Madrid. The news story points to the fact that whether Ronaldo is the super most football player of the new age or not, but even his rivals will admit that the boy got his car choice. This is bit unusual yet fantasizing that Ronaldo’s fleet includes all that you count for toppers. 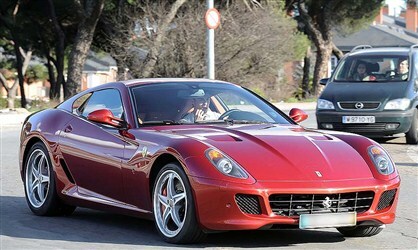 He has a Porsche 911 Cab, Bentley’s Continental GT, Porsche Cayenne Turbo, Ferrari 599 GTB and BMW M6. Yeah, all those hundred thousand dollar editions. Possibly this is one of high valued fleet of cars, I mean luxury cars, privately held. The news report had also mentioned that Ronaldo is after a Buggati. Yes, a million dollar car of all time, Ronaldo is hunting!